Many people can point to annual events which indicate the beginning of summer; fireflies, the baseball all-star game, end of school, fireworks, mosquitoes, etc. 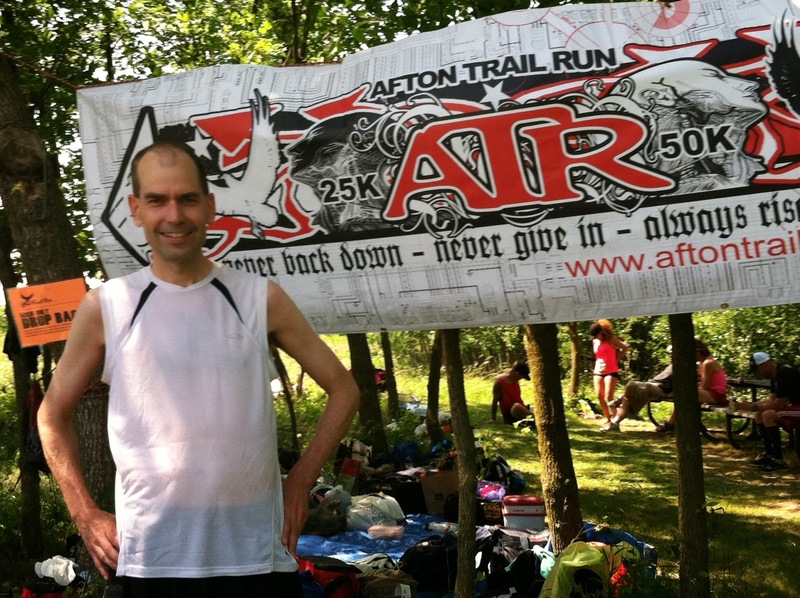 For me it is Afton, specifically the Afton 50k Trail Run put on by John Storkamp each July in Afton State Park along the Saint Croix River in Minnesota. Each Afton is the same; same great organization, great people, low-key vibe, and hills (eight notable per loop). And then each Afton is different; park closure reroutes, rain, varying heat, and humidity, trail conditions. This year stood out for me because of the nice cool weather (I don’t think it broke 80°F) and the fantastic breezes in the open areas. This actually turned out to be one of my favorite Aftons. And it might be my last. My family and I are moving to the Oshkosh, Wisconsin area in the next few months and I’m not sure I’ll have the opportunity to make it back to this great race. I know there are a few races on the IAT and the Northern Unit in that area, so I won’t be wanting for good trail races. I will be documenting my new running digs through this blog though, and will be continuing it as long as I have more than one reader, other than my mom. 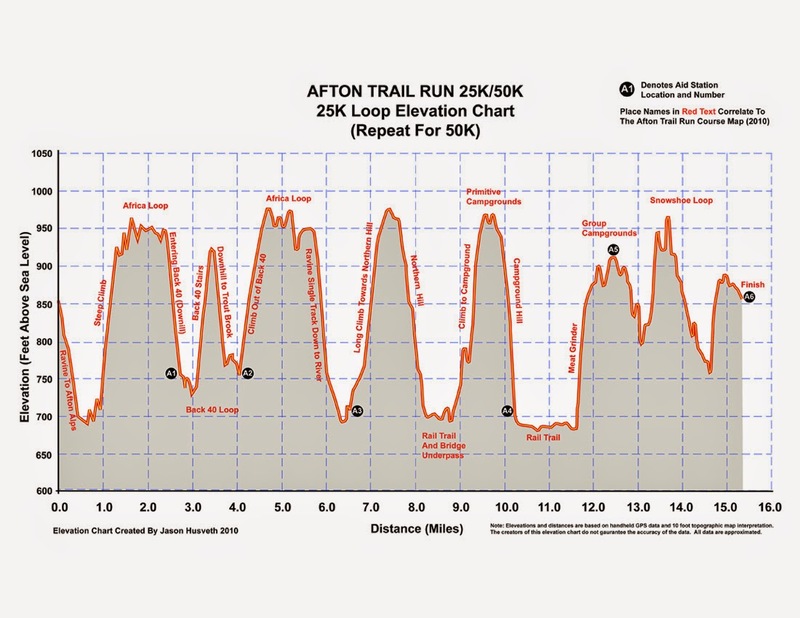 This race has been held at Afton State Park in Minnesota for the past 20 years or so. 25k and 50k distances are offered, depending on whether you traverse 1 or 2 loops through the park. The trails range from gravel road to singletrack, from wide open prairie to dense forest, from railroad bed flat to eroded washout hills. Total elevation for the 50k is about 4,700 ft of climbing. 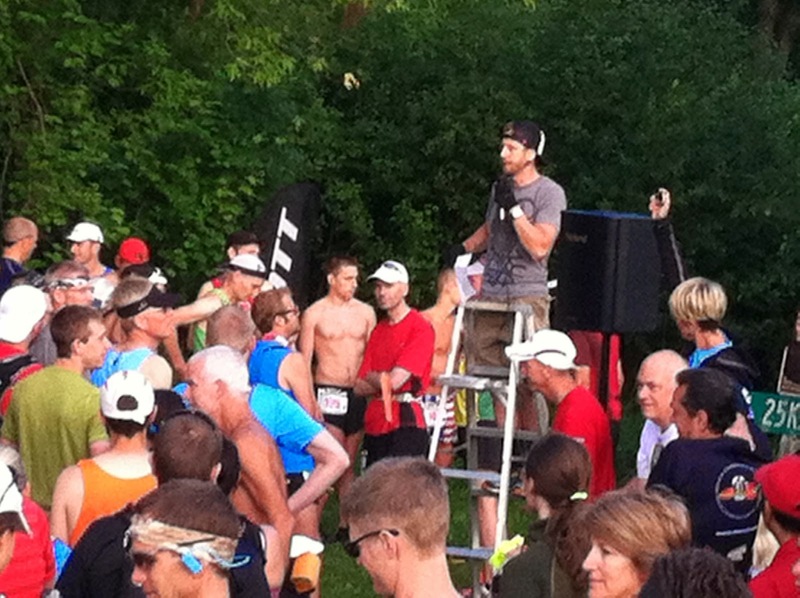 This year 340 or so folks opted for the 25k distance, while about 170 braved the 50k. The morning of the race was uneventful. I did not get much sleep the night before (fireworks), but I felt fine, considering. I also ignored the temptation for a nice scoop of cream cheese for breakfast (read here for that bit of stupidity). After a nice drive into the park, and a smooth packet pickup, Beth (crew) and I (runner) were at the start with about 15 minutes to spare. John, the race director, gave us some encouragement and guidance, and then asked who had done 5 Aftons? 10? A few raised their hands. This would be my fifth, with sub-5 hr finishes in the last 2. I was hoping to improve on this trend. As a prelude to this race, I ran (and finished, woo hoo!) the Kettle 100. Following this race I had some interesting recovery issues with the ball of my left foot and the associated Achilles tendon. That, along with the usual calf and hamstring decimation, I was hardly fully-recovered. I was, however, in decent enough shape to run a 50k hard. In truth though, I had no idea how my legs would respond. We’d see. Beth and I ran into the Kettle RD Tim Yanacheck, who was there to crew his wife. In fact, I ran into him at various points along the course, and as usual, he had great encouragement for me. He is truly one of the good people. I usually start this race near the front, and this year I think I was too far so. As we careened down the first descent to the base of the ski hill, runners were zipping past me. The descent is kind of like a cattle chute, so I let others past as well as I could. It was evident that my foot “injury” limited my speed on rocky descents. But things cleared up quickly. The fast people took off, and I took in with a like-minded group at about a 7:30-8:00 pace. The temperature at the base of the ski hill was nice and cool. Ahhh. I love this race (before it gets hot). The first hill hit quickly. It is about 250 ft, not too steep, and with a few false tops thrown in. I had planned on running all the hills if I could, and did just that. So far so good; my legs felt fine. The top of the first climb takes us up to the Africa Loop; beautiful, grassy prairieland along with the associated micro-fauna. Think Serengeti sans lions and wildebeests. It was still cool in the early morning and a fantastic breeze was blowing, keeping everyone cool. Time to pick up the pace! Following a mile or so of smooth prairie running, we descended into another climate zone called the Back Forty. This area is more rain forest than prairie, and it tends to be pretty hot and humid. The descent was pretty painful for my foot, but not debilitating, and before I knew it I was zipping past the first aid station (AS) and onto some nice singletrack. The Back Forty is a nice 2-mile section off the Africa Loop, with a section of stairs thrown in for fun. Keeping with the plan, I ran those stairs and was back to the aid station in no time. The climb out of this section is pretty gradual and affords the opportunity for a running ascent back up to the Africa Loop. Once on top, the breezes cooled me off nicely. This section of trail then leads to a wonderful descent to the third AS by the Saint Croix River. I really like this descent, but today I had to take it easy due to the foot issues. It was still fun. Beth was waiting for me at AS 3 with a bottle of UCAN, and an S-cap. I did not ask for a time update; I was running as fast as I could comfortable maintain, so it wouldn’t really matter. After the quick turnaround at the aid station, I was off, up Stone Hill. Like the previous hills, I ran Stone Hill to the top, and was greeted again with the breeze. I could feel it warming up a bit, but it was only in the 70’s I think. Still cool for Afton. From the hill top, the trails wrapped around the beautiful north end of the park, and then dropped back down to the river. My favorite vista is on this section of trail. Of course, once we dropped, it was time to climb back up. Up the most gnarly of hills in the park, this thing was washed out with exposed rocks and roots. I didn’t run this climb. I trudged the steepest sections really. And then I was on top, through the campground, and back down to the river. Beth was again ready for me at AS 4. She replaced my UCAN, and this time gave me a bandana full of ice, ice for under my hat, and some ice down my shirt. I was sick of turning into a hyperthermic zombie in races past, so Beth and I came up with a plan: ice, early and often. I will say this, I stayed cool throughout, though I think because of the benign conditions, this was a bit of overkill. Oh well. I think at this point I told Beth that my legs were hamburger, and wasn’t this fun? That’s where I was at. Out of AS 4 is a nice flat section that makes you think it is time to put the hammer down. I’ve long ago learned that this would be a mistake for me. 7:30 pace would have to do through here. I swear, this flat section hurt more than the hills. But before I knew it I was at the end of flat and heading up Meat Grinder, the 6th of the 8 hills. I continued to run the hills, so I was up in a jiffy and into AS 5. I never know what to expect from this aid station when I round the bend; it was an inexperienced but enthusiastic girl’s cross-country team one year. This year AS 5 was all business, and I was in and out with a fresh water bottle and gel. From there it is down into the absolute best portion of trail in the park; the Snowshoe Loop. From the initial descent, you are assaulted with wondrous singletrack winding up and down though a forested section, with a few open areas and a tough climb thrown in for good measure. I approached this section with Newton’s first law in mind. Run it hard, and the up-hills can be dealt without concern with inertia. I did run hard, and was soon climbing back out to the straight-away to the start finish area. One loop done, and I felt pretty good. In fact, I felt I might have PR’ed that loop. Not even close. I saw 2:23 on the clock and my heart dropped with disappointment. The perceived effort was there, but the speed was not. Oh well. I still felt fantastic, and it was time to gear up for the second loop. At the start/finish area, I changed my shirt, re-UCAN’ed, and re-iced, and then I was back down the chute for my second loop. Well, the second loop was much like the first loop, only a bit slower. I never bonked or even felt remotely overheated. The temps never really became an issue for me in this race. I really was enjoying myself! I kept on running the hills like before, and counted them off as I climbed each. 8-7-6. On the downhill coming out of the campground, I passed a 25k runner who was in obvious pain. I thought I’d encourage her a bit: I said “These downhills sure do hurt, don’t they!”, as I scampered past. All I got was a glare. Hmmm, maybe a “Way to go” would have been more appropriate. I did see Steve Quick on Meat Grinder and introduced myself. At that point I was in a bit of a zone, so I completely blew off the photographer Steve was conversing with. Sorry. Throughout the second half of the race, I was swapping positions with another guy named “Steve”. We would encourage each other as one passed, but it was evident we were in the same Age Group, so I think there was some competing going on. I sure was feeling it. Steve seemed a great guy, and he sure was running strong. Coming out of AS 5 going into the Snowshoe Loop, he was right behind me. Great. I said something like “Let’s hammer this last section”. He seemed game. So much for reverse psychology. He stayed right behind me as I picked up the pace on the initial drop. I wasn’t really trying to lose him just yet, we had a couple of climbs yet to come, and I wanted to gauge his energy on them. Plus, I was tired. I hiked the second-to-last hill and he stuck to me like a booger. So about 2/3 of the way to the top I started to run, and I opened a bit of a gap by the apex. I then put the hammer down for the last time. I knew there were trail twisties coming up and if I had a gap on him here, he might have a tough time keeping me in sight. Sure enough, I saw no more of Steve after this section. It always feels good to be in the last sections of a race and to still be racing. I ran as hard as I could through the last bits of valley and hill until at last, the climb out and the half mile or so of flat to the end. I ran this section as hard as my hamburger legs would allow, and I crossed the line in 5:08, in 31st place. Not a PR, but I was pretty happy. I ran this race as hard as I could on un-recovered legs and had fun doing it. Plus, I was lucid at the end, and not really feeling injured. Weird. The winner, Wisconsin native Michael Borst, finished in 3:43, 3 minutes off last year’s course record. Way to go Michael! Thanks again to the legions of great volunteers who put on this great race. Thanks to Afton State Park for allowing the event to take place in their beautiful park. And thank you Beth for sharing these experiences with me and getting me through the aid stations quickly. By the way, anyone want a kitten or two? I have five that can't make the move to Oshkosh. Great seeing you out there (and I really want a kitten, but can't take one). Thanks Steve! It was great to finally meet you. Thanks for coming out. As for the kitten, maybe you can take 2?